This week on TreeHugger, amazing animal sculptures made from CDs, DIY solar power packs for gadgets, an app for driving that will save you fuel, and more! Sean Avery transforms junked CDs into colorful and creative works of art. These gorgeous lights take a cue from even more gorgeous coral reef structures. This rather phenomenal statue crafted from wire and cell phones is interesting, but we'd love to have seen one major thing done differently. Breathing new meaning into the term 'hot air': A new design concept could charge your gadgets with your own breath. 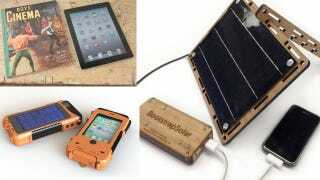 The Chi-qoo Solar Power Pack from Bootstrap Solar can charge just about anything, and comes as a kit, great for DIY-ers. Designer Endrit Hajno has come up with a design for a toy that teaches kids how to not only generate, but monitor renewable energy. EcoSpeed, a new app that finds the most fuel-efficient route for your drive and then gives pointers on driving behavior while you go, could cut fuel use by 30 percent. Snow Lizard has unveiled their ultra-rugged, solar-powered and waterproof iPhone case, perfect for outdoor warriors. An easy and fun project for book lovers.